The Zapatera Archipelago in Nicaragua consists of Zapatera Volocano and 8 islets, all sitting lazily in sun drenched Lake Nicaragua. One of these islets is Isla del Muerte, or Island of Death. Something to do with human sacrifices. 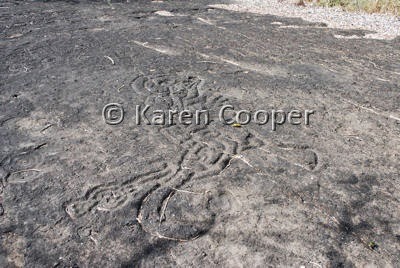 The petroglyph's on these islands are simply amazing and well worth the effort to get here. Another term for petroglyph is "rock art". Makes sense when you see the deeply etched markings on flat rock faces that look like ancient graffiti. The etchings have various styles and shapes. There are literally hundreds of them. I can imagine someone a lot of years ago trying to depict their world as they saw it. Maybe to them plants and animals, and for that matter, humans, did look fanciful and other-worldly. No kidding, some of these creatures look like they have space helmets on, with feathers stuck all over the place. An ancient version of a very bad hair day. I like imagination. Combined with art, it makes for some interesting mind stretching. And, combined with the enormous amount of effort it must have taken to actually carve these markings into solid rock, I am duly impressed. The Island was called Island of the Death by natives because a Spanish man was found dead in its coast during the Colony, but its original name is La Ceiba Island. This comment is by One of the rightful owners of Zapatera Island, who is a direct descendant of the 2 original owners. Thank you so much for your comment, is there any written material documenting your history and the history of the islands? Or photographic documentation that you know of?